Five people were killed in clashes between supporters and opponents of Egypt's ousted president in Alexandria. Five, including a 14-year-old boy, were killed on Friday in clashes between supporters and opponents of deposed president Mohammed Morsi, the head of the health ministry's emergency sector told the Al-Ahram website. Ibrahim El-Roubi said that the boy was stabbed with a bladed weapon in his stomach. Another man was shot in the head, he added. Anas El-Kady, spokesman of the Muslim Brotherhood in Alexandria, claimed in a press statement earlier in the day that two of the slain were supporters of the ousted president. 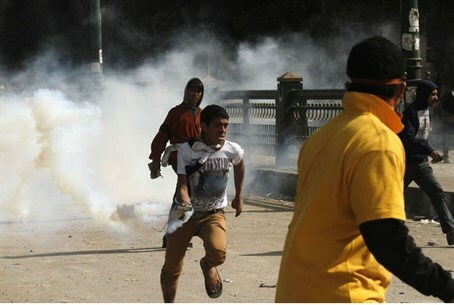 At least 146 were injured in the clashes, according to state-owned news agency MENA. Most of the injuries were caused by birdshot and bladed weapons, reported Al-Ahram. The country's army chief Gen. Abdel-Fattah a-Sissi called this week for rallies to give him a mandate to stop "violence and terrorism." The supporters of former president Mohammed Morsi, who was removed by the military earlier this month, also held rallies Friday. Friction started outside a major mosque in Alexandria, as the two sides exchanged stones and fired birdshot, the Lebanese-based Daily Star reported. Police and army tried to break up the fighting, lobbing tear gas and deploying soldiers. Health official Mohammed Abu Suleiman said two were killed and two dozen injured. Massive crowds poured into main squares in Cairo and other cities in support of the military, according to the report..
At the same time, crowds of Islamist backers of Morsi massed at their own rallies, part of what the Brotherhood and its allies had previously said would be their biggest protests to date to demand the reinstatement of the president. The Egyptian state prosecutor on Friday ordered that Morsi be held for questioning for 15 days on suspicion of working with Hamas to attack and kill Egyptian security personnel. The accusations relate to attacks and prison riots in early 2011, during mass protests against the rule of then-President Hosni Mubarak. Morsi is accused of having coordinated prison breaks in which prisoners and guards were killed. Dozens of members of Morsi’s Muslim Brotherhood group escaped jail in the breaks. On Thursday, the Egyptian army gave the Muslim Brotherhood until Saturday afternoon to sign up for political reconciliation, though it indicated that it would not crack down on Muslim Brotherhood members even after the ultimatum passes. On Wednesday, fresh arrest warrants were issued for nine Muslim Brotherhood officials in Egypt, including leader Mohammed Badie.